Our Story Niagara Winery - Pillitteri Estates Winery Inc. Since arriving in Niagara, Canada in 1948, the Pillitteri family has been committed to creating a legacy for generations to follow. 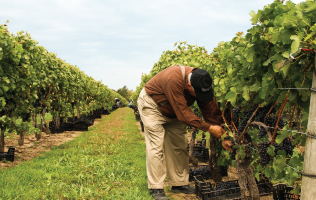 Now, over six decades later, Pillitteri Estates Winery proudly continues a family tradition of viticulture and winemaking excellence. With three generations actively involved with our winery’s operations, we can truly say that each bottle of wine we make is a product of our family’s passion. We are proud to be able to share the fruits of our labour with wine enthusiasts around the world, and consider each person that enjoys a glass of Pillitteri wine to be a part of our family. The Pillitteri story begins in old world Italy with Gary as a child working on his family’s vineyard. The move to Canada in 1948 began the journey. Aleksandar Kolundzic our winemaker brings with him over 15 years of experience and expertise in winemaking. Pillitteri Estates Winery is located in the heart of Canada’s largest grape growing and winemaking region, only 17km from the world famous Niagara Falls. Pillitteri has won over 800 awards for our wines and Icewines. We proudly display many of these awards in our awards gallery.